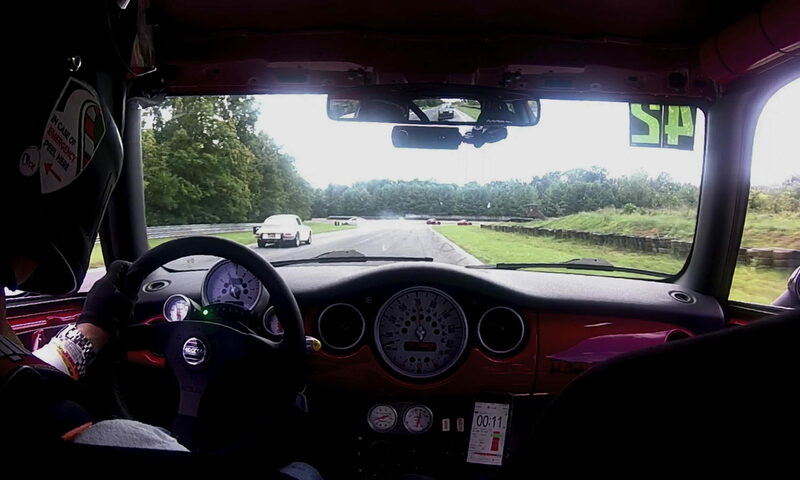 I decided to take the MINI to work this morning to see if everything was back in order after recently replacing the motor mount. The engine seemed to be running a little rough, but I just figured the new motor mount was a little more firm than the old one. I got off the highway after one exit due to traffic and I got the dreaded CEL (Check Engine Light.) I hate that light. It might as well say, “Yo. Something’s wrong. I know what it is, but I’m not going to tell you. 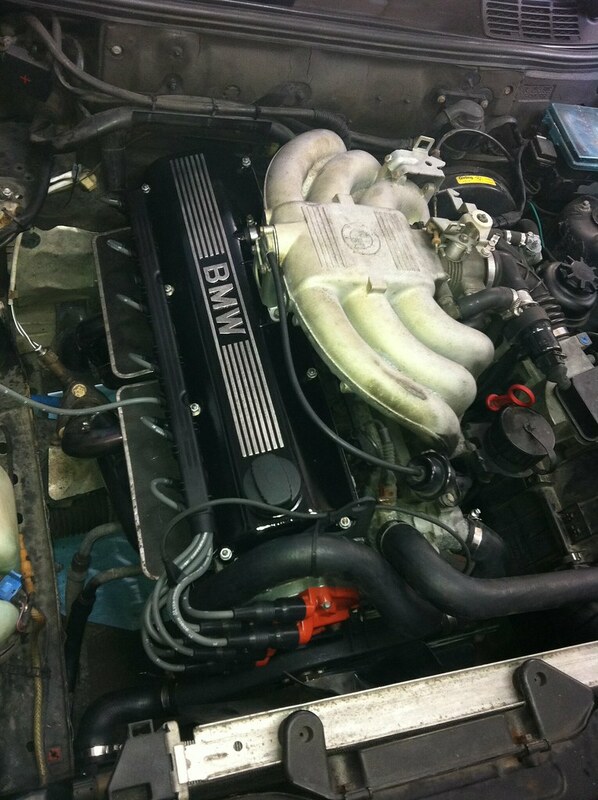 Here’s a hint: It’s under the hood….” And the car went into limp mode. Fortunately I still had my code scanner which told me it was code P1688. That’s handy. What does that mean? Ugh. I just turned around and headed home. I’d have to reset the ECU every 5 minutes, but it is a pretty hilly route so I could do lots of coasting. So what is P1688 you ask? Not what it seems. 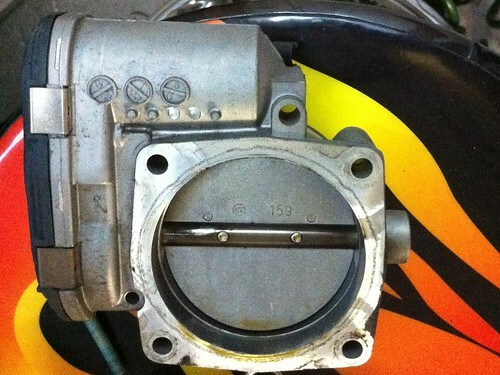 P1688 is the code for “Electronic Throttle Control Monitor Level 2/3 Mass Air Flow Calculation”. Which would indicate a problem with the throttle body, but I also had code P0107 last week at the track which is “Manifold Absolute Pressure/Barometric Pressure Circuit Low Input”. With those two together, the car is saying that for a given amount of throttle, there just doesn’t seem to be enough boost going on. 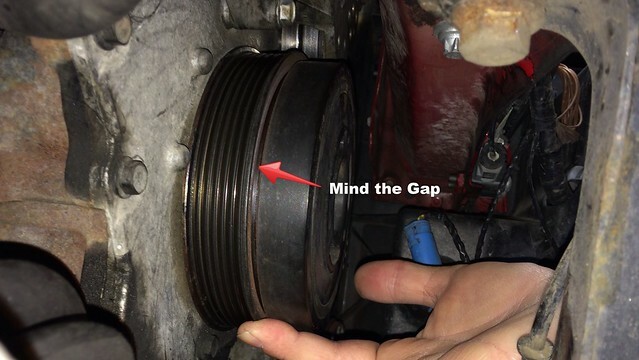 And on the R53 MINIs that usually means the crank pulley (or more accurately, harmonic balancer) is shot. The stock part is about $200, but since this car gets lots of track time, better to upgrade to a more robust model. 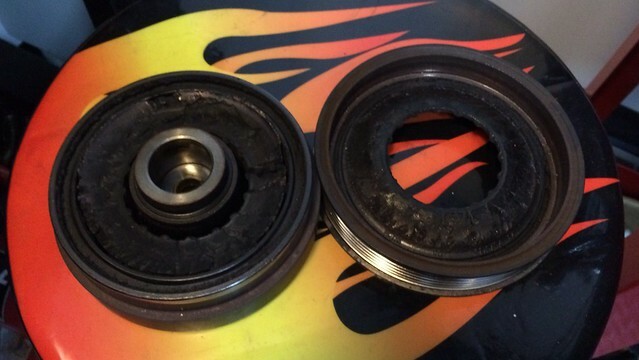 ATI Performance makes a Super Damper for about $350. As the old damper started to disintegrate, it took a good amount of the old belt with it. 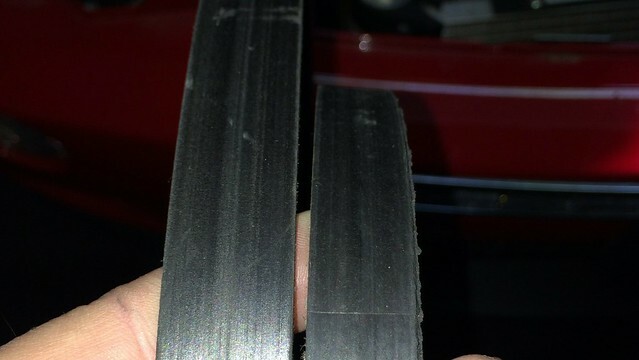 The old belt has had one rib sliced off. These two belts should be the same width. Once you get the right front up on a jack-stand, remove the wheel and fender liner, and use a belt tensioner tool to remove the belt. 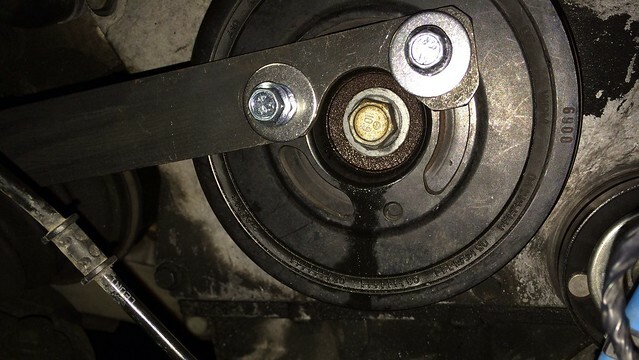 You can’t tell if the damper has gone bad by viewing it from the front, but when you look at it from the side, you’ll see a gap developing as the belt pulley separates from the damper. You can use a universal pulley removal tool if you’re careful. You will need to buy 3 M6 bolts that are long enough to work with your tool. Be sure to get the hardest bolts you can (10.9). 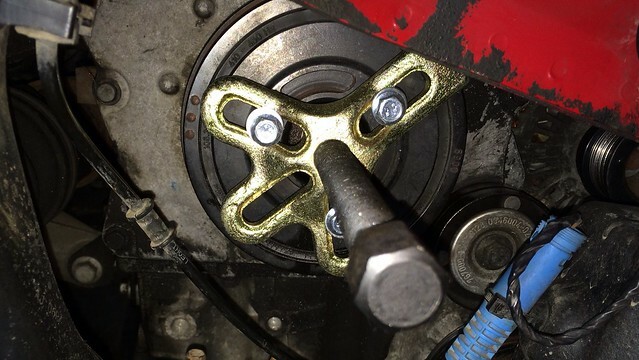 First step is to remove the center bolt. Use some penetrating oil before you start. You may get lucky and be able to remove it just by putting the car in 6th gear and having someone stomp on the brakes. But for me, the crank still turned. I ended up using a brace to stop the crank from rotating. In this case, it’s a tool for removing a fan from an E30. Go figure. Now the real fun begins. If your tool did not include an appropriately sized center pin, then put the bolt back in and tighten, leaving about a half inch of threads showing. Attach your pulley removal tool. Have a helper hold the bolt with a wrench as the pulley tool will be pushing against the bolt and it will try to screw back in. When the bolt makes contact with the damper, you have to back it out some more and adjust everything and go again. Make sure the M6 bolts are not twisting. 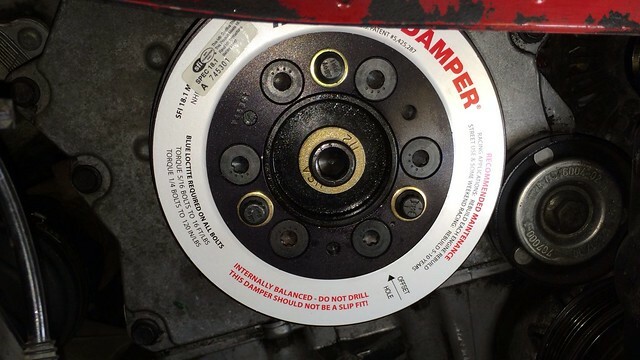 You should be able to compare the location of the damper to the other pulleys on the front of the engine to judge if you’re making progress. I ended up having to replace the bolt with a longer one to get the last quarter of inch of travel needed to remove the damper. With the damper removed, you can see where it scored the engine as it oscillated. I’m surprised that didn’t make more noise…. Start the new super damper by hand. Heat it with a heat gun or hair dryer if it doesn’t start easily. Use the supplied long bolt and washer to grab enough threads to pull it on most of the way. 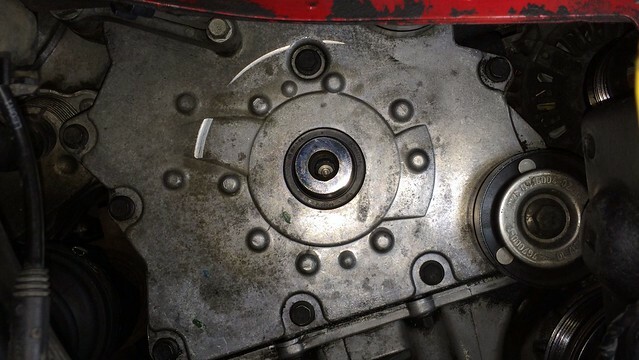 Continue until it bottoms out, then remove the bolt. 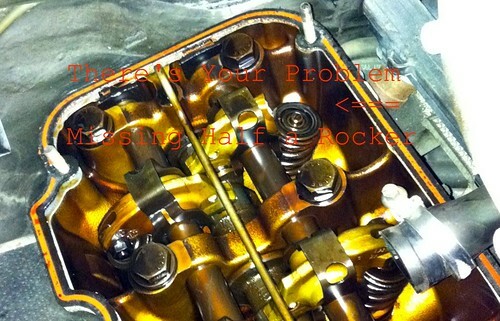 Use a new OEM bolt to finish installation. Apply blue loctite and torque to 85 lbs. Reinstall the belt, taking care to route it correctly. 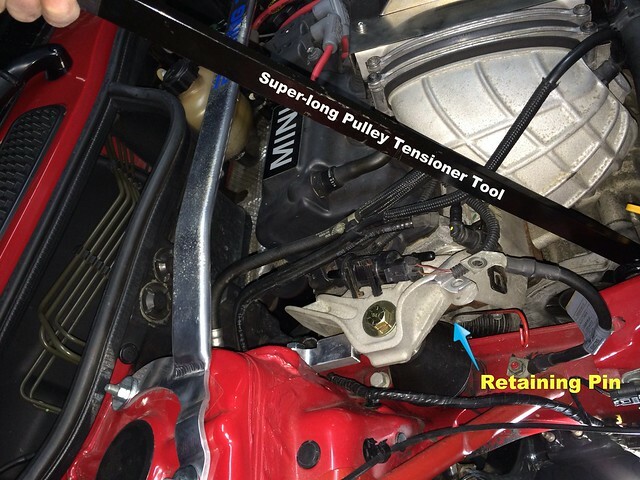 Carefully release the belt tension using tensioner tool. 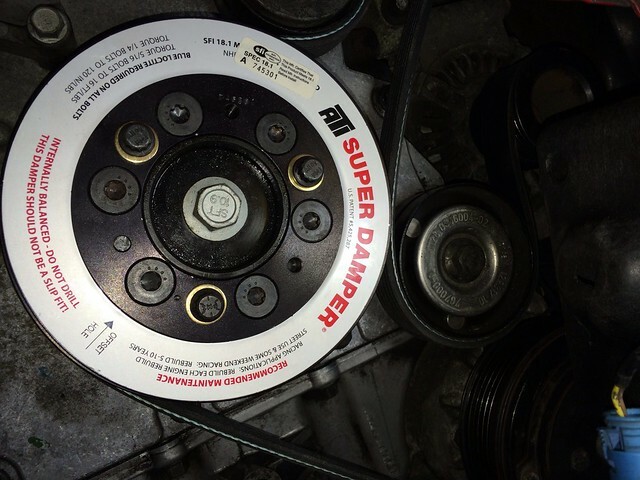 Start the engine to check if everything is OK and the belt alignment is straight. Then reinstall the fender liner and wheel. Torque wheel to 87 ft lbs. Continuing our theme of making up for delayed maintenance tasks, today we tackle cleaning the throttle body. 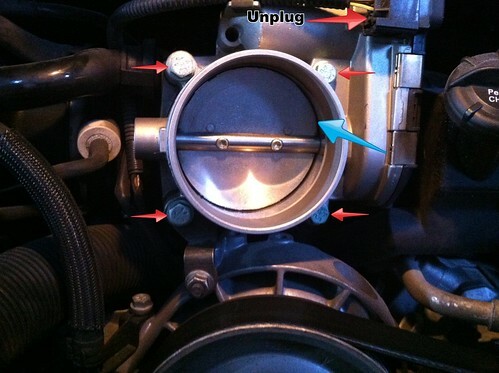 A dirty throttle body may affect throttle response and decrease gas mileage. For all 996s built after the 2000 model year with “e-gas” (throttle by wire) this task should take 30 minutes or less. 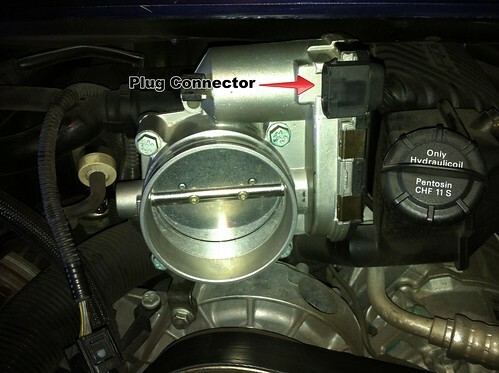 For earlier cars with an actual throttle cable, the process isn’t really that much more complicated, but the throttle cable does have to be disconnected. Inspect the throttle body before removing it. Look especially along the leading edge of the butterfly valve for crud buildup and any evidence of scoring or foreign object damage. 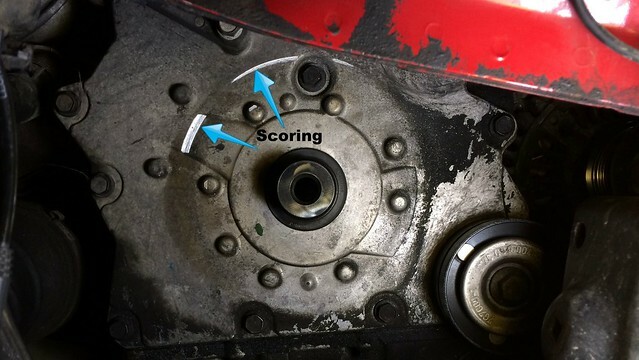 Remove the four bolts indicated by the red arrows and disconnect the electrical connector at the top. 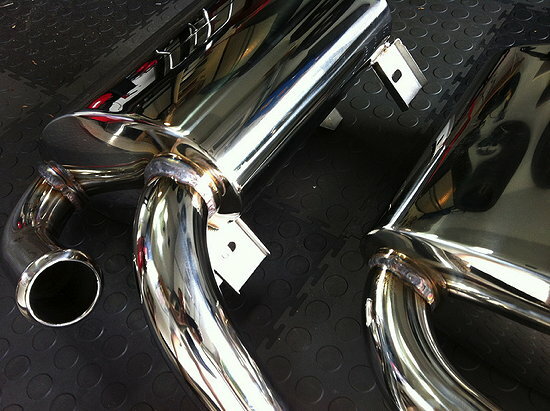 Inspect and clean the intake plenum. Look for foreign objects and excessive sludge. Clean as necessary. Put the throttle body on your workbench and inspect both sides for build-up and damage. Clean using carburetor cleaner. Carefully open the butterfly valve manually to get to all of the areas needing cleaning. Installation is the reverse of removal. Be sure to reconnect the electrical connector at the top. 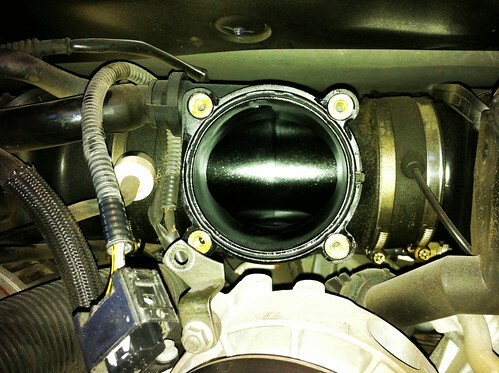 Clean throttle body looks almost brand new. I finished the ignition upgrade last night. 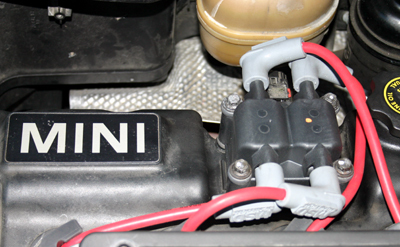 The latest performance project for the MINI was to improve the ignition system to match the improvements in airflow in and out of the engine. 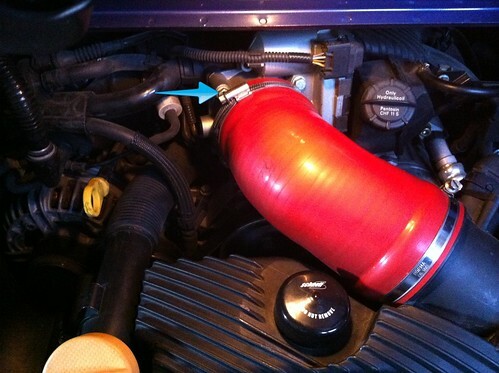 Because the smaller pulley produces more boost, the induction air is a bit hotter than stock. 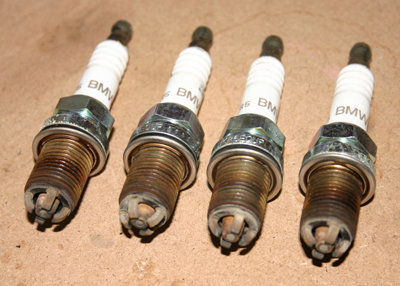 Since the air is hotter, the spark plug is one step cooler. Because the air/fuel mixture has more potential energy, the coil is upgraded to produce a stronger spark. To get that stronger spark to the cooler plug more efficiently, a plug-wire with lower resistance is used. This all doesn’t add up to more horesepower directly, but should reduce horsepower loss due to system inefficiencies, if that makes sense. The net result is a smoother running engine and actually better fuel economy. The combination I used included MSD 8.5mm wires and a Screamin’ Demon Coilpack (like the MSD coilpack) and NGK Iridium Plugs. I was actually surprised by the condition of the old plugs. My MINI now has over 60,000 miles in less than 3 years of motoring. These are the original plugs. They’re rated to 100,000 miles and would probably make it. (An even tan color is good.) I’m used to plugs that wouldn’t last 10,000 miles let alone 60. Interesting to note that this is only the second part (after the brake caliper) that I’ve found that says “BMW” on it.